Next time you swing your +3 flaming longsword at an owlbear, you may be following in the footsteps of pharaohs. If Scooby Doo is to be believed, the ancient Egyptians spent most of their time cursing mummies, booby-trapping pyramids, and summoning Anubis. According to more recent advances in anthropology, however, many of them were just everyday Joes (in this case, maybe Thutmoses) hanging out, just trying to have a good time like everyone else in history. Perhaps that explains this nifty ancient d20 straight out of Egypt's Ptolemaic period currently at the Metropolitan Museum of Art. The die is made of a mineral called serpentine, an ultramafic rock fairly common to ancient architecture and sculpture. The carvings on each face are Greek in origin-there's pretty clearly a lambda, delta, beta, theta, and some others in the pictures-which depending on context can either represent a letter or number. Unfortunately, we're not exactly how this particular die was meant to be used, but do know the Egyptians were pretty significant gamers, as far as ancient civilizations go. 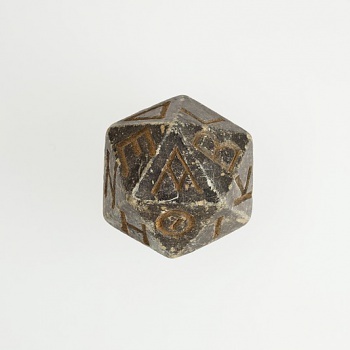 While housed at the Met, the d20 is sadly not currently on display. I'm sure if you asked one of the curators, he or she would tell you something about exhibit schedules and space considerations, but I like to think those jerks are just in the back room during lunch breaks trying to roll natural kappas in their ongoing game of Sarcophagi and Sphinxes.